This Saturday, June 27th, I will be taking my family on a trip to Napanee, ON. and then to Ardoch, ON. to do some camping with our friends at their trailer park. 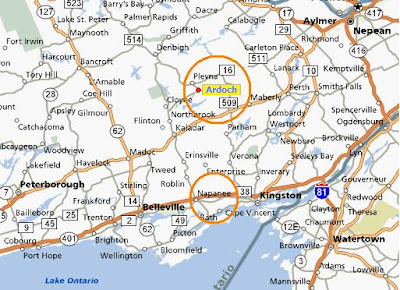 Note the orange circles on the map showing Napanee (on the bottom) and Ardoch (on the top). I am looking forward to the trip and the change of scenery. Last year we went to the trailer in Ardoch and we all loved it up there. The trip from Sarnia to Napanee is approx 6 1/2 hours and then from Napanee to Ardoch is another hour north. I am looking forward to the trip and the nice change of scenery. While I am up there I plan on taking many pictures of the area. When I get back I will post some for everyone to see. Only two more days left of my work and then I am on vacation for 10 days! Yeah! Labels: Ardoch, camping, Napanee, trailer park, vacation.